SOLD!! **LX Edition ** 4 Slides ** Loaded ** Clean ** Tons of Storage ** Slide Toppers ** Alum. Wheels **2nd A/C ** Loaded! 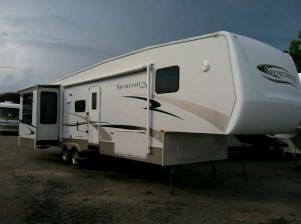 This 2007 K-Z Sportsmen is an LX Edition featuring 4 slides, all with slide toppers, aluminum wheels with less than 2 year old tires, a 2nd A/C in the front bedroom. It is a unique floorplan with a rear lounge separate from the kitchen area rather than combined with the kitchen. You will love and appreciate all the storage this unit has to offer. This coach is a must see for those looking to get a large, not so heavy fifth wheel, who wants to save money vs. buying a new one. Get a lot for you money.